Larian Studios are a talented group of individuals who are best known for their Divinity series of games here in the West. Their creative and ambitious staff draws upon decades of RPG's, table top, strategy, and other games. They have a very intriguing game on their hands at the moment titled Divinity: Dragon Commander. 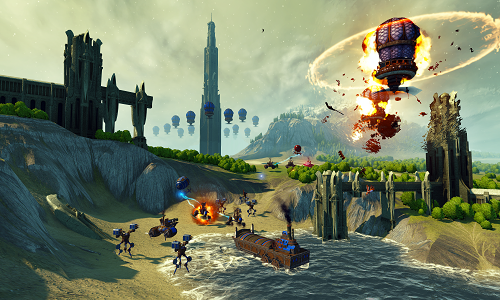 At it's core, Dragon Commander is both a turn-based and real-time strategy game. It also integrates FPS mechanics, branching narratives, and even at times dating-sim elements. In theory, it sounds like a Frankenstein mashup of genres. In practice, the elements actually fit together quite nicely, and the delivery is fantastic and presented in an interesting yet tidy package. Recently at a nice bar in San Francisco, Larian Stuidos hosted a preview for Divinity: Dragon Commander and Divinity: Original Sin. While there, I got a chance to spend a good deal of time with both the single player and multiplayer game modes. In single player mode, each turn starts in your airship. You assume the role of a dragon commander who takes on a humanoid form to interact with denizens of the ship. The ship features a council of advisers who bring various matters that warrant your attention. Each adviser is an ambassador of a particular race, and they come complete with their own political ideologies. Among them include a conservative dwarf, a liberal elf, and a libertarian lizard. The elf immediately came to me with an urgent matter - the legalization of gay marriage. I chose to allow the practice to be legalized throughout the nation. Immediately, the dwarf voiced his disapproval at the idea. It was then revealed to me that pleasing different factions would carry rewards in the form of increased access to technology as well as cards by using an affinity system. Dragon Commander revolves heavily upon the use of cards, of which there are reported to be over 100. Cards run the gamut from reinforcing or healing troops, to preventing an enemy from building structures. They are an interesting way to add flair to the game system, and they are a very important part of multiplayer combat as well. Aside from the council, the dragon commander can also explore other parts of the ship in single player. These places include a bar full of heroes, including a feminist human female. The lady revealed a brutish dwarven practice called "The Long Night" in which unfaithful wives were left alone in the forest to be devoured by wolves. I felt the practice unjust so I assured her the matter would be resolved. Resolving conflicts and managing the political sphere of your kingdom is an important part of the game. Larian Studios has done a great job of capturing relevant real-world issues and transforming them into an easily digestible context. They have also taken care not to sway the dialog in a particular fashion, so as not to reveal their own political inclinations. Eventually, the dragon commander will be asked to take a wife, with choices and implications that fit the overall theme of political influence. By itself the mechanic might have felt detached, but by tying technology and cards into the political influence scale, the mechanics feel like a welcome addition to the game. The following mechanics involving troop management and combat are the meat of both the single player and multiplayer portions of the game. I was able to team up with another person and together we commanded our own armies against another team of two. Our turn began with a view of a whimsical map divided into territories. In each territory was a number, usually around 1600. We learned that the number represented the number of troops that a territory contained. This is vital to the mechanic of combat. We had a starting income, and a number that represented our incoming income for the next turn. We also had a few starter units such as the hunter or heavy armor. I moved the units out of my starting territory and "controlled" the territories they went to. With my income, I purchased some naval ships and land units and moved them around as well. Additionally, I purchased some technology that would bolster the power of my anti-air units. Finally, I took a look at my starting cards. When I ended my turn, the game waited for the other players to end their turns. When everything was finished, I was privy to the places where everyone moved their units. My ally happened to move to a territory that our opponent moved to, so all four of us were thrust into battle. 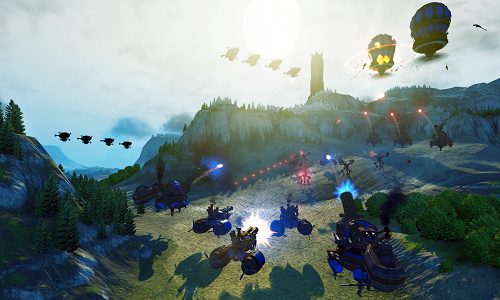 The game follows this pattern of strategic turns followed by lively RTS combat. Cards will become an even bigger part of the equation later in the game, and you will also have the ability to trade cards and resources. 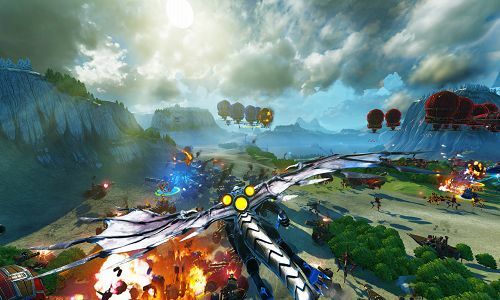 Although it wasn't available for play, there will also be a special cooperative mode that will allow one player to control the troops during battle and the ally to control the dragon. This mode intrigued me greatly, as I was having a bit of trouble with commanding the dragon, and felt better suited to raising an army. 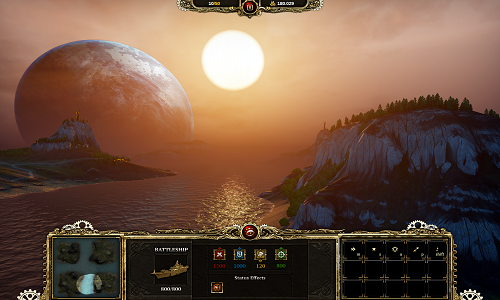 I greatly enjoyed my time with Dragon Commander, and it promises to be an amazing and fresh take on the genre. It will also feature some very innovative cooperative play elements that can lead to some very epic battles. There is no release date for Dragon Commander as of yet, but stay tuned for more information as it becomes available from Larian Studios. Page created in 0.8161 seconds.